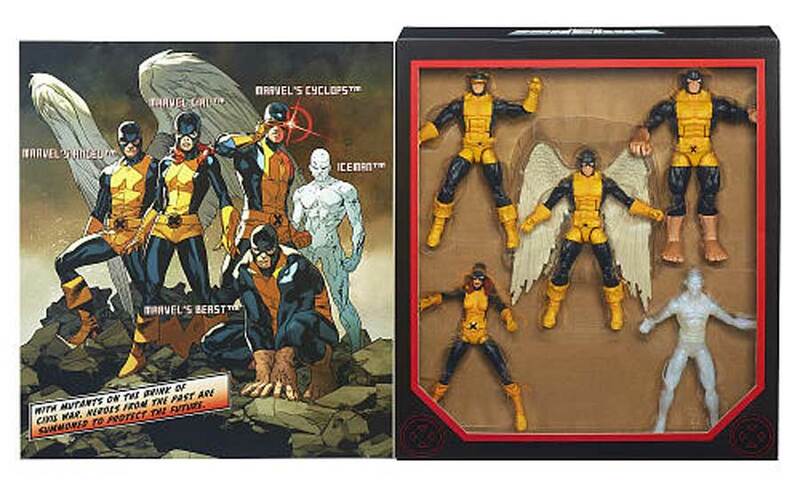 Toys R Us has listed their latest Marvel exclusive – the Hasbro Marvel Legends Original X-Men boxed set. 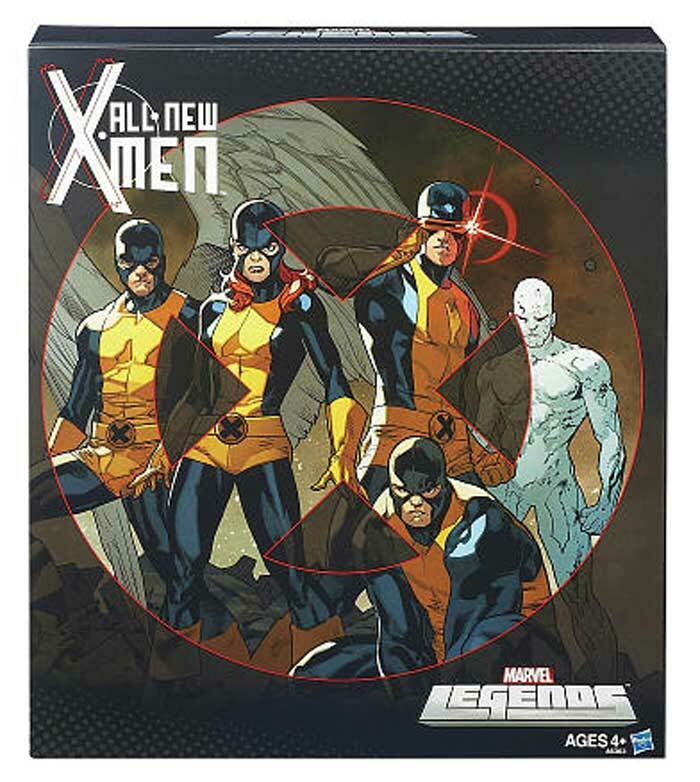 The set includes the original versions of Cyclops, Marvel’s Angel, Marvel Girl, Iceman and Beast in one boxed set. The set is up for order right now on ToysRUs.com for $119.99. – UPDATE – This morning TRU changed the price on-line to a staggering $139.99! That’s a whopping $28 per figure!! Update #2 – It looks like TRU has pulled the listing off of their website. Hopefully it’s to adjust the price to something reasonable. Amp up your X-Men adventures with a blast from the past with this All New X-Men Set! This is a box full of heroes from the past, including Marvel’s Cyclops, Marvel’s Angel, Marvel Girl, Iceman and Marvel’s Beast figures. Each figure stands ready to defend the X-Men and the human race from certain disaster! Your collection won’t be complete without the figures in this All New X-Men set! The price on the TRU site for this set is now $139.99. $120! (+ tax). Talk about gouging. At about $25 per figure TRU will have problems selling it. I, like most other folks who want it will likely wait for the price to eventually come down. $140 now these folks are nuts the product just isn’t that good. I might have paid $85 but not this insane price. I’m seeing $139.99 at the website! The price of $120 was already insane! They look pretty good, and I’ve wanted this set for awhile. However I’m seeing a lot of parts reuse and I can’t justify buying this until it’s at least 50% off! That is INSANE!!!!!!! I thought $85 was way too much. Iceman looks like crap (unless the actual figure looks better). Angel’s face doesn’t thrill me and Beast is too tall. It’s like Toys R Us wants to go out of business. Well the pricing is clearly insane, but here’s another complaint – static poses to display super articulated figures! Great that Beast is bigger than the others, but how does he look hunched over or crouched down? The way these things are posed they could have 5 points of articulation. AND….they are removed from the site. How odd! Item listing was taken down now – it be gone… I used their online chat to ask them why, here’s what they had to say ““We are only web specialists here to help navigate the website. We do not know information about products..” — Yep, TRU has become one of those stores (K-Mart, Sears, Walmart more I’m sure) that just go through the motions on CS care. Too bad, they could have been a great company. This would have been the 1st thing I’ve bought from TRU in years… now I’ll wait, or just pass.